Now A days Who Doesn't want to be Richer, Healthier, Job and Want to go abroad.There are some many problem we are facing and unemployment, Jobless,Many Youngsters wish to go abroad for bright future but they face lots of Difficulties That is Why we decided to share Some useful and powerful wazaif for our Respected Visitors. The Above given Image is the wazifa for Being Richer and if you trust Allah and Follow as we said then soon Kalam Elahi make you rich. 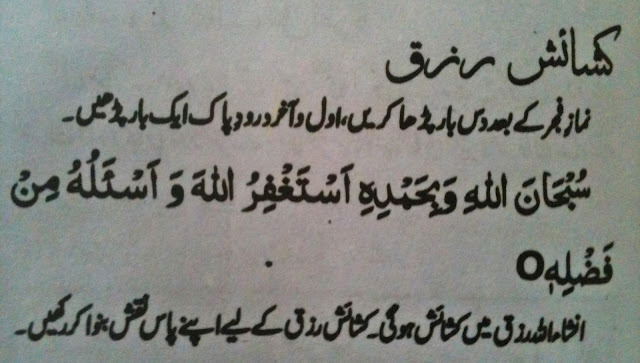 Do this Wazifa before fajar Prayer or between Sunnat and Farz rakat. 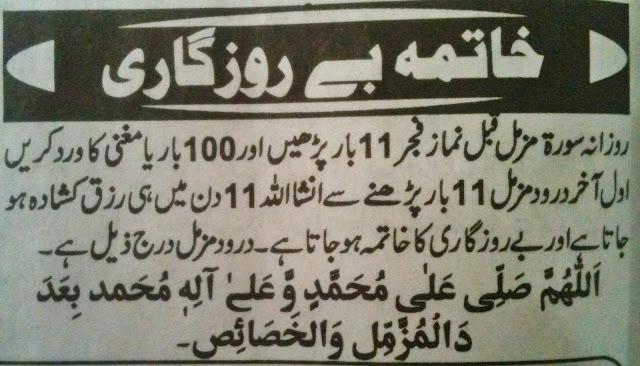 100 Times below Given Ayat.
" Subhaan Allahe Wa Be ham dee Subhaan Allahil Azeem wa Be hamdeehee Astaghfir- Ullah"
How to Do Disease Healing wazifa. Read this Dua on Doctor Prescribes medicine for 3, 5 or for 7 days. You have to read Sorah-e-Fatiha or Alhamd Sharif with Durud sharif before and last. After Namaz-e-Fajar you have to read Durod Sharif 1 time, then read this Ayat 10 times, ( Ayat is Written Below) " Subhan Allahee Wa-Bi-Hamdeehee Astaghfir-Ullahaa Wa Asaalohoo Min Fazlehey"
Inshallah by Blessing of This ayat you get more Rizq. For Unemployment this wazifa is very good. Before namaz-e-fajar you have to read 11 times Surah-e-Muzammil then 100 times " Ya Mughniyoo" and again 11 times Sorah-e-Muzammil..
With 11 days you get a nice job or Allah will arrange a your business setup, or open your ways to go ahead. 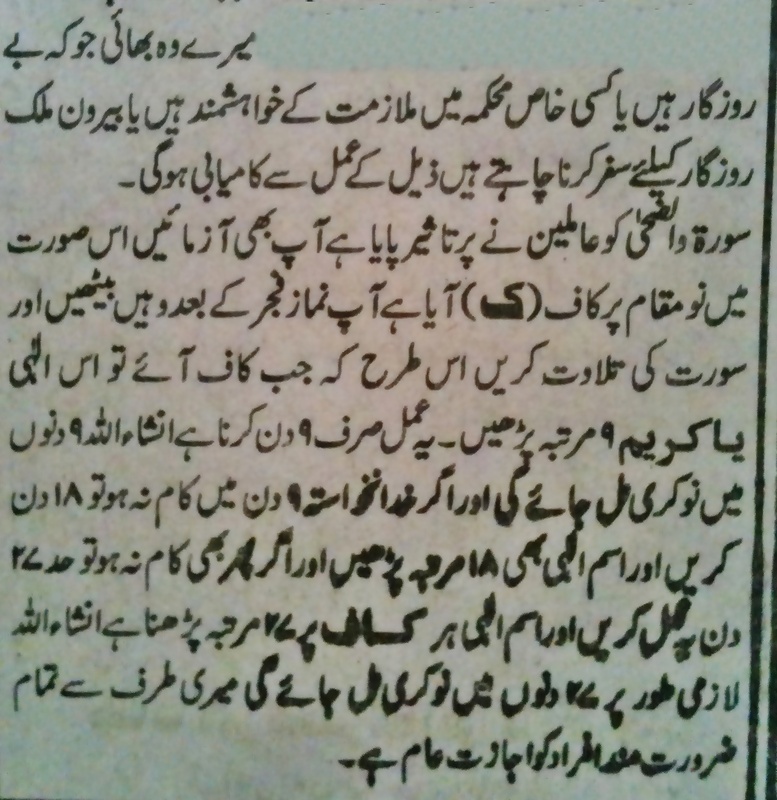 you have to read Surah-e-Waz zuhaa , you can find 9 times word " Kaaf" in it. 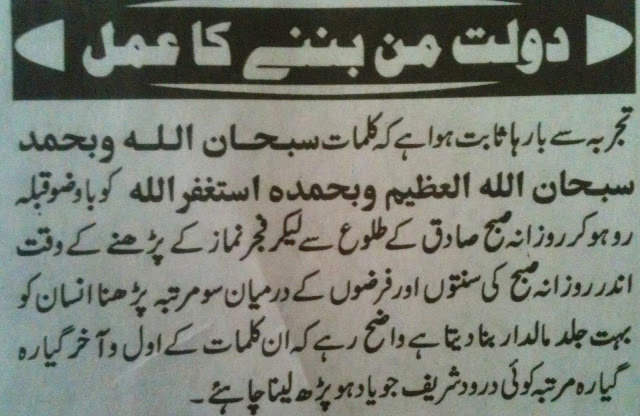 so you have to be careful and find all 9" Kaaf" and then start wazifa. start reading Surah-e-Wazuhaa and whenever Kaaf will come read there " Ya Kareemoo" 9 times. so like this there are 9 Kaaf and you have to read 81 time Ya kareemoo in complete Surah.This Wazifa take 9 days and within 9 days you get job if in any case you didn't get job then continue this wazifa till 18 days.and start reading Ya Kareemoo 18 times. Note : Many people Asking from us that there is no "Kaaf" in Surah Az-Zuha so we are going to share Surah az-zuha in which we underlined " Kaaf " with red lines. For more information or questions please please contact with us on Skype, Mobile or through Email. we feel happy to guide you and help you in your matter. Here is our Skype id and Other Contact details.